When shopping for the best gas-powered chainsaw of 2018, you want to make sure you have a well-rounded chainsaw that is able to take on a wide range of projects that aren’t too complicated or too large. Gas powered chainsaws combine power and mobility and range from light-duty to professional grade model making them powerful enough to take down large trees. Here are a few tips on what to look for in the best chainsaw for homeowners and a few gas chainsaw reviews to help you start shopping. Knowing how you plan to use your chainsaw will help you decide what type of chainsaw to use. Do you just plan on doing a little pruning in your yard or do you have intentions of cutting down a lot of good-sized trees? Consider the type of projects you have planned to do in your yard and then look at the models that that are appropriate for these tasks. Gas chainsaws are the most powerful and fastest chainsaw options, so if you plan on doing heavy-duty cutting jobs, gas-powered is your best bet. The guide bar length is taken from the where the guide bar enters the housing to the tip of the chain. This shows you your active cutting area and the biggest area of wood that your chainsaw will be able to cut in a single pass. It is still possible to cut large pieces of wood with a small chainsaw, you will just have to use two passes to do it. For safety reasons, you should make sure your bar length is approximately 2″ longer than the wood you plan to cut. For instance, if you are planning on cutting a 16″ tree in only one pass, then you need an 18″ or larger guide bar. If you plan to cut a large tree in two passes tree with a small chainsaw and have a bar length of 14”, then you should be cutting a 28” inch tree. This is not recommended to do on a regular basis as it would be good to get heavy duty chainsaw for cutting trees that large regularly. Your average homeowner will probably need a bar length under 14” for light cutting while those that do medium-sized cutting will want a bar length between 16” to 20”. Professionals who do heavy-duty cutting will want a bar length between 22” to 36”. Remember that the longer the bar length, the harder the chainsaw is to handle and the greater the risk of injury. As the chainsaw can become unbalanced, you can become fatigued when the chainsaw begins to feel heavy after using it for a long period of time. Kickback can also become an issue when you are using a longer bar length. A common term to hear when you are using a chainsaw is kickback. This is caused when the tip of the guide bar hits another object. This happens because the chain on the saw moves in a circular motion and rotates forward and away from you going around the tip of the bar to change direction and then moves back towards you. Where the change in direction happens at the top quarter of the nose is called the kickback zone. Kickback can also be caused when the bar is pinched by wood on either side of the guide bar. This can happen when you are cutting and the wood closes in pinching the chain on the inside of the cut. This can a fast reverse reaction that kicks back the bar up and back towards you. Size and power are always important considerations when determining the top rated gas chainsaw, you also want to consider safety, comfort and efficiency as well. Throttle Interlock – This is an additional safety features that makes you depress two triggers to start the saw lessening the chance of an accident. The following are the best chainsaws in the market in 2017. If you are looking for the best lightweight gas chainsaw, the Hitachi CS33EB16 2-Stroke Gas-Powered Rear Handle Chain Saw only weighs 11 1/2 pounds, and it comes with a sixteen inch bar and 34 cubic centimetre motor. It is a pretty durable saw that also features a soft-grip handle that lessens vibrations that are usually found with any chainsaw. The Hitachi also features a combined start lever and choke with the soft-start, reducing the force that you need to pull it by 40 percent. It also includes a manual purge pump that primes the carburetor before you turn it on and pull. It’s also not incredibly loud register at a little over a hundred decibels, and it also features a handy window for checking the fuel-level and a combination tool under its handle. The Hitachi also features a dual trigger where both trigger components are needed to start the chainsaw. If you are looking for long engine life, the Poulan Pro PP5020AV 2 Stroke Gas Powered Chain Saw gives you a bigger engine with 50 cubic centemetres and a twenty inch-bar, and with its chrome-plated cylinder, a prolonged engine life. You get plenty of power and performance out of this fifteen pound saw, plus it has an anti-vibration feature, and a chain oiler that is automatic, a carrying case, and a built-in wrench/screwdriver. The Poulan Pro Gas Powered Chain Saw features a trigger lockout and a safety stop button that can be pushed easily with your palm. The chain brake can also be activated with a lever found on the top handle. Even though the Tanaka TCS33EDTP/12 Top Handle Chain Saw with Pure Fire Engine may seem small with a twelve-inch bar and a 32.2 cubic centimetre engine, the smaller bar is sometimes more useful for certain pruning work. Its starting system is similar to that of the Poulan Pro and the Hitachi, but it actually has a much higher success rate in starting. Even though it is small, it weighs more than the Hitachi at 11.9 pounds. The best small gas chainsaw features an easily accessible chain adjustment and a chain oiler that is automatic. Designed for smaller-diameter cutting, the Tanaka has a slightly different handle configuration with a dual trigger. It also has a chain brake that is lever-activated, an easy-reach stop button, and an activation lever/shield with a built-in lanyard ring. Another powerful chainsaw on our list is the Remington RM5118R Rodeo 2-Cycle Gas Chainsawwith a 51 cubic centimetre engine and an eighteen-inch bar. It features a typical start that includes Remington’s Quickstart technology that uses electronic ignition. Weighing 25 pounds, this is a heavier chainsaw than other we have reviewed, but it tackles big jobs with lots of comfort due to its vibration damping technology. The Remington also comes with a chain oiler that is automatic and adjustable and a carrying case. This is the perfect chainsaw for trimming trees, cutting firewood, or clearing out storm debris. It also features several safety features including inertial braking and a stop button that is mounted on the top of the handle where it is easy to reach. When you are looking for an incredible amount of power, you need to check out the Husqvarna 460 Rancher 2-Stoke X-Torq Gas Powered Chain Saw with its 60.3 cubic centimetre engine and twenty inch bar. 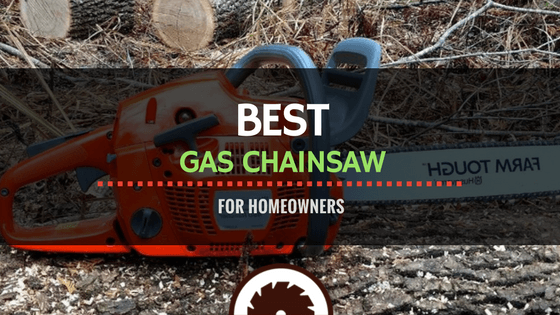 It gives you the largest and most powerful combination in a gas powered chainsaw on our review list. Using Husqvarna’s "X-Torq" engine, they have improved torque throughout the rev range, and it also features a pull-start that is very easy to use. Weighing less than thirteen pounds, the Husqvarna is not the heaviest chainsaw on our list, but it does have the largest-capacity engine. It also has an anti-vibration features as well as the ergonomics and balance that Husqvarna offers making this saw as easy to handle as a smaller saw giving your average buyer an almost professional performance. With a simple chain adjustment and an adjustable and automatic chain oiler, the Husqvarna is easy to use for the average person. The Husqvarna features an air injection system that blows away most of the dust and debris from the filter giving your chainsaw a longer life. Husqvarna also includes the inertial chain braking systems well as the stop button, the trigger lockout, and chain brake lever. Plus, it features a top handle with a shield and lever that is canted at seven degrees giving you a better grip and lessening user fatigue. With the most powerful motor and highest cutting capacity, this is a chainsaw for those that want to do more than occasional pruning. This chainsaw is perfect for those that plan to chop down good-sized trees, cut firewood, or work on woodland regularly. This is also a well-balanced machine that is easy to start and simple to maintain with plenty of safety features that you would come to expect in a high-quality chainsaw. Hands down, the winner of the round up is the Husqvarna 460 Rancher 2-Stoke X-Torq Gas Powered Chain Saw. It features a heavy-duty 60.3cc engine and a twenty-inch bar that gives you the largest and most powerful combination in a gas powered chainsaw on our list. This is also a pretty lightweight saw that features a large-capacity engine, an anti-vibration feature, and ergonomics making this is a professionally performing saw that the average buyer could easily use.